Oil industry - Texas "tea"
Now almost three years into the oil plunge that started in November 2014, the new "normal" is clearly lower prices for oil that seem to struggle to stay in the lower $40 per barrel. This new "normal" has significant ramifications for certain Texas regions that had hyper-growth for many, many years largely due to oil. As a result, a distinct shift in power, money, and growth has occurred toward cities and regions with a much greater diversification of industry and commerce and with much less reliance on oil. It may be too soon to write OPEC's obituary, but the oil producer club appears in urgent need of late-life care. It shows little understanding of where it is, how it got there or where it's going. While it still manages to collect new members here and there, its core group looks more fragile than at any point in nearly 30 years. The historic output agreements, put together so painstakingly last year, are failing. Nearly 12 months of shuttle diplomacy culminated in two deals that would see 22 countries cut production by nearly 1.8 million barrels a day. Implementation has been better than for any previous output cut, with compliance put at 106 percent in May. A resounding success? Hardly. We're now in the final month of those deals and oil prices are lower than when they were agreed. Not only have producers sacrificed volume, but they earn less for each barrel they do produce. Last edited by Cord1936 on 25 Jun 2017 23:26, edited 1 time in total. Re: Oil industry - Texas "tea"
If you think the Middle East is a mess now, just wait till we knock its economy out from under it? This type of shift is going to start creating pressure on traditional oil companies future revenue streams ... not overnight of course, but as the electric and hybrid solutions start proliferating the impact will start to be felt. This is an "old school" mainstream automaker who is ditching the conventional combustion engine in a dramatic change that is only 2 years away ... will other car makers follow? Last edited by Cord1936 on 05 Jul 2017 10:36, edited 2 times in total. I45Tex wrote: If you think the Middle East is a mess now, just wait till we knock its economy out from under it? There's plenty of uses for oil and gas besides car fuel. But if something better comes along, the oil kings in Texas are more than foolish if they try to keep the state's industry artificially relevant. Invent a better battery, but don't politically prolong the death spiral of fossil fuels. Natural Gas power plants will probably emerge as the dominant supplier of industrial energy. Pollution is much more effectively controlled, and power is almost on demand. While true, the majority of oil production does still go to gasoline. According to these statistics from two years ago 51.4% of oil is used for gasoline production. The timing of the announcement was also significant, a day after the automaker Volvo said it would phase out the internal combustion engine, and during a visit to Europe by President Trump. As part of a set of ambitious new environmental goals, France expects to do away entirely with the sale of diesel and gas vehicles by 2040. ...He admitted that doing away with the sale of all fossil-fuel-powered cars in the world's sixth-biggest economy would be challenging, even to the point of constituting a "revolution," but he said French carmakers would be up to the task, according to Reuters. The ability to extract petroleum for gasoline may not matter. Fretting over just how much oil is left and where in the world it is may finally begin to matter less and less. If it got to the point that very impressive research and technology by oil companies figured out a way to inject proprietary blends of carcinogenic water into the deep earth so oil will float through porous rock, sucked to the surface for gasoline, why are we still waiting for auto manufacturers to come up with a new engine that doesn't use gasoline? Yes, adoption of hybrid and electric vehicles is happening faster than CEOs at major, legacy automakers could have imagined. And while low gasoline prices in the United States have discouraged Americans from buying more fuel efficient cars, the rest of the world is moving toward electric power. Volkswagen, another European car maker that eschewed the new engine types, announced plans to phase out the internal combustion engine. The company will roll out two SUVs, a sedan and a hatchback that are battery powered in 2019. As Tesla begins delivering its Model 3 to customers, and has back-orders through the end of 2018, 2019 looks like it will be a breakthrough year for electric vehicles. Six new models have been announced for 2019, including long-range cars from Audi, BMW, Jaguar, and Mercedes-Benz. Automakers are not producing these cars for the U.S. market, though, which is why we won't see this transition as early as other nations. The real market for electric cars is China, where the government is offering the middle class generous subsidies and incentives to buy electric. Lower Chinese demand for crude is bad news for oil companies, since most are relying on growing demand in China to keep afloat as demand in the U.S. and Europe continues to remain static or fall. China also is manufacturing 10 low-cost electric cars that can be exported to poor countries, another pillar of future demand for oil. UBS, a financial services company, predicts that electric vehicles will start reducing gasoline demand no later than 2031. Admittedly, hybrid and electric vehicles are only 1 percent of cars produced today, but some estimate they will be 30 percent of new cars produced in 2030. Since the customer is always right, the market is responding to this change. And the transformation is likely to accelerate in ways that we can't yet imagine. Last edited by Cord1936 on 07 Jul 2017 15:17, edited 1 time in total. None of this is surprising, but I'm not concerned at all for North Texas. We are pretty diversified at the moment, and that doesn't seem to be changing anytime soon. The Oil&Gas industry has been in a slump for a while, and it hasn't hurt us all that much. Houston has been hit pretty hard, but hopefully they can find a way to recover. DPatel304 wrote: None of this is surprising, but I'm not concerned at all for North Texas. We are pretty diversified at the moment, and that doesn't seem to be changing anytime soon. The Oil&Gas industry has been in a slump for a while, and it hasn't hurt us all that much. Houston has been hit pretty hard, but hopefully they can find a way to recover. Totally agree .. whatever pain the oil downturn was going to cause Dallas has already happened ... which has been minimal. Ft. Worth has been more negatively affected as it has a greater Oil & Gas dependence. The Dallas-Plano-Irving metro's enormous diversification has kept it soaring during the downturn. Cord1936 wrote: Totally agree .. whatever pain the oil downturn was going to cause Dallas has already happened ... which has been minimal. Ft. Worth has been more negatively affected as it has a greater Oil & Gas dependence. Honestly, I'd say this may have actually helped DFW in a weird way. Before the downturn, it seemed like Houston was our biggest competitor (in Texas) and we were basically neck and neck with them (they may have actually been ahead, depending on what you're measuring). Texas was booming, and people all over the nation were eyeing Houston, DFW, Austin, and San Antonio. Now, Texas is still booming, but Houston doesn't exactly have the same appeal as it did a few years ago, and it doesn't help that the near future doesn't look all that hot. Seeing as how they were our closest competitor, this, by default, puts DFW in the clear front runner seat as far as Texas goes. DPatel304 wrote: Honestly, I'd say this may have actually helped DFW in a weird way. Before the downturn, it seemed like Houston was our biggest competitor (in Texas) and we were basically neck and neck with them (they may have actually been ahead, depending on what you're measuring). Texas was booming, and people all over the nation were eyeing Houston, DFW, Austin, and San Antonio. Now, Texas is still booming, but Houston doesn't exactly have the same appeal as it did a few years ago, and it doesn't help that the near future doesn't look all that hot. Seeing as how they were our closest competitor, this, by default, puts DFW in the clear front runner seat as far as Texas goes. Interestingly enough... I was riding the train (Amtrak... yes, people actually do ride it) across western Colorado last week, and the National Park Ranger who was giving the trails & rails presentation explained that over the last few months, many of the fracking wells that were closed down years ago as oil tanked are now seeing a flurry of activity again. Apparently, they have gotten the process down to a manageable cost that even with oil prices where it is today, they can make a profit. There was evidence all around... shale was about to boom once again. I'm thinking the oil industry still has some run in it for the near future. It's the middle east and Russia who are more to suffer by what now appears to be a low/stable oil price. muncien wrote: Interestingly enough... I was riding the train (Amtrak... yes, people actually do ride it) across western Colorado last week, and the National Park Ranger who was giving the trails & rails presentation explained that over the last few months, many of the fracking wells that were closed down years ago as oil tanked are now seeing a flurry of activity again. Apparently, they have gotten the process down to a manageable cost that even with oil prices where it is today, they can make a profit. There was evidence all around... shale was about to boom once again. I'm thinking the oil industry still has some run in it for the near future. It's the middle east and Russia who are more to suffer by what now appears to be a low/stable oil price. This is true, hear it all the time. I believe the breakeven price is down in the low to mid 40's now. A price that is good for consumers and really bad for OPEC. The price of oil is more than likely down to stay, too much supply and rapidly emerging alternatives. Another European country moving toward banning traditional combustion engines ... this time England with a goal of 2040. Cord1936 wrote: Another European country moving toward banning traditional combustion engines ... this time England with a goal of 2040. This is nothing in comparison to what China intends to do. China basically forced Toyota to ditch their focus Hydrogen Fuel Cell technology and focus on electric. This is impressive since Toyota was basically the only major auto manufacturer holding out on EV technology. "Keen to combat air pollution, China is planning to set goals for electric and plug-in hybrid cars to make up at least a fifth of Chinese auto sales by 2025, with a staggered system of quotas beginning in 2018." That's a lot a EV cars. "You wait decades for an existential crisis, then two come along at once. At least that's how it must feel for OPEC's beleaguered ministers. In the short term the market for their oil is being eroded by rising production outside their control. Looking further ahead, oil demand itself is under threat from the electrification of road transport. OPEC may not yet be dead, but its days are surely numbered. The most obvious short-term existential threat to the group comes from the rapid rise in U.S. shale oil, but the risks have expanded to include other areas like Brazil's prolific sub-salt discoveries and more recent finds further north along the east coast of South America." "Van Beurden also articulated the second existential threat, when he said in an interview with Bloomberg TV not only that his next car would be electric, but that he could see demand for liquid fuels peaking in the 2030s. A political trend towards growing electrification of transport poses a real, long-term problem. Nobody in their right mind is suggesting that oil is suddenly going to stop being the world's transport fuel of choice, but its market share will come under increasing pressure. Four countries in Europe have now proposed bans on the sale of gasoline and diesel-fueled cars by 2040 at the latest. Between them they account for around a third of all the passenger vehicles in use in Europe." "Rapidly falling battery costs will make electric vehicles as affordable as their gasoline or diesel rivals over the next 10 years, according to Bloomberg New Energy Finance." 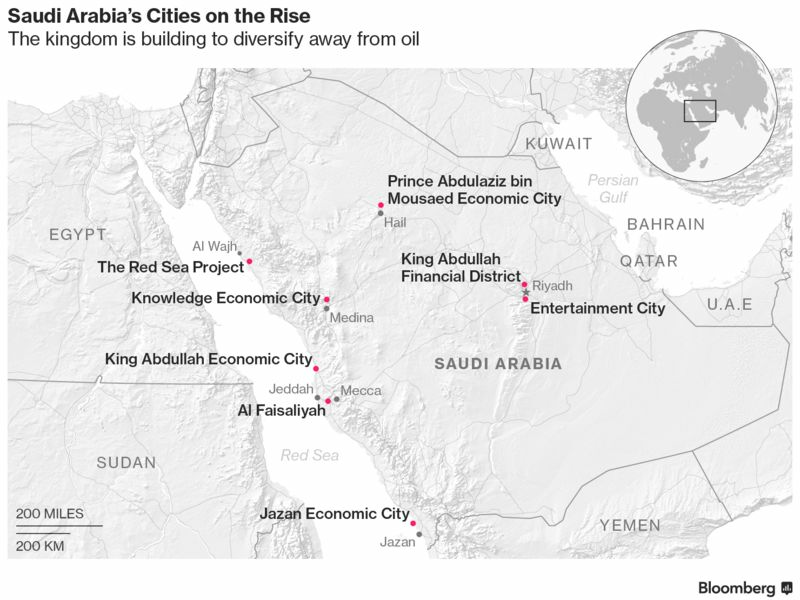 After relying on oil to fuel its economy for more than half a century, Saudi Arabia is turning to its other abundant natural resource to take it beyond the oil age -- desert. The kingdom is converting thousands of square kilometers of sand into new cities as it seeks to diversify away from crude, create jobs and boost investment. In the past month alone, the world’s biggest oil exporter has announced two major developments -- one covering an area bigger than Belgium and another that will include an airport and shipping port. That’s on top of plans to build a series of so-called economic cities -- special zones in logistics, tourism, industry and finance, an entertainment city and a $10 billion financial district. What is Texas doing to take the economy past oil? tamtagon wrote: What is Texas doing to take the economy past oil? They don't have time for that right now. They've got to protect the womenfolk from non-existent threats in the potty. Kinda reminds me of the Catholics and the Middle Ages. So... Our inspiration should come from a country where women aren't allowed to drive? huh? Also, never read Dave Egger's book Hologram for a King. It's set in King Abdullah Economic City. Worst book I've ever read. Texas is far and away the biggest Wind Energy producer in the U.S., would be 5th in the world if it was an independent nation. Texas has a huge, growing Tech industry. Corporate HQ presence. Not sure what more Texas can do to diversify...but yay for Shale, just one more win for the Lone Star State. It's just a whole lotta money from the oil industry. Why is the overall tax burden so low in Texas? Because the state's governments collect so much money from extraction of fossil fuel products. Texas may be the biggest wind energy producer, but that amount of energy is tiny compared to the amount of energy that comes from the state's fossil fuels... and the amount of revenue generated by wind is tiny compared to the amount of revenue that comes from fossil fuels. When we as a culture finally acknowledge that our quality of life will increase exponentially when we stop living in the pollution generated by fossil fuels, the state of Texas will have a huge revenue hole to plug. There's no reason to start a transition now, while the oil/gas money is still flowing. I think the Barnett Shale is mostly tapped out, but if it gets going again through another round of "technological" innovations, earthquakes might not be the only side effect of trying to frack our way to energy independence. So, who's going to pick up the tab for the eventual damage caused by fracking? By the time the carcinogenic extraction brews reach up the food chain and start making people sick, and by the time sinkholes, uplifts, and/or earthquakes cause property damage the precipitating oil companies activity will be long and/or will have put up a legal maze of subterfuge that'll take a decades to navigate. The sinkholes in Winkler County are a product of dissolving salt layers. To get similar sinkholes here, we would have to have a soluble strata of salt. If it's not one thing, it's another. Flaming water spigot is good at parties! We ought to see some phenomenal growth in Corpus Christi, especially if the extractors can get the natural gas piped there. The Permian Basin's stacked layers of oil-laden rock under the west Texas and New Mexico dirt are already so productive they've stymied efforts by the Organization of Petroleum Exporting Countries to reduce supply, and brought the U.S. closer to energy independence. The field produces 3.2 million barrels a day, more than OPEC member Kuwait.